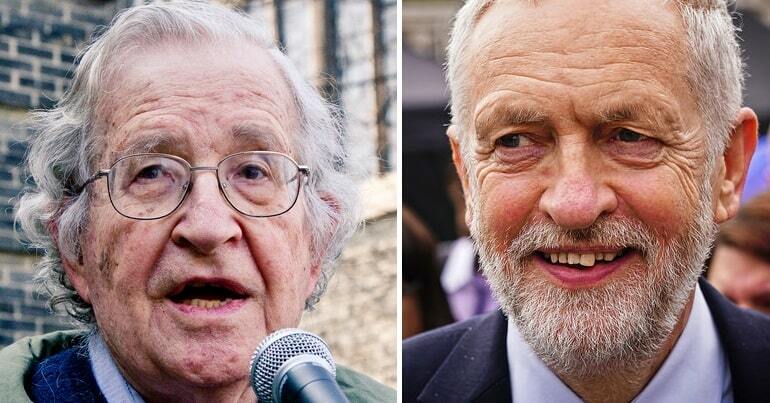 Renowned Jewish intellectual Noam Chomsky has taken apart the antisemitism smears against Jeremy Corbyn. authentically concerned with the rights of suffering and oppressed people throughout the world. Corbyn’s Labour has pledged to place UK foreign policy in line with international law. The party will end all arms sales to regimes if there is concern they are committing war crimes. Labour would also create a new minister for peace. Plainly an intolerable threat to order. In a similar vein, a pro-Israel campaigner openly spoke about “weaponising” antisemitism to banish Corbyn from “public life” on Sky News. The smears against Corbyn rely heavily on misrepresentation. For example, mainstream outlets spent days accusing Corbyn of hosting an ‘antisemitic’ event in parliament in 2010, because speakers compared the actions of Israel to the Nazis. But at the meeting, a Jewish Holocaust survivor was addressing a room of predominantly Jewish people. Broadly speaking, the total cases of antisemitism in Labour represent less than 0.1% of around 540,000 members. With that in mind, widespread smears undermine the genuine instances and genuine concerns about antisemitism in Labour and wider society. On 16 September for instance, Conservative environment secretary Michael Gove refused to condemn the openly antisemitic and Islamophobic far-right leadership in Hungary. That’s after the Conservatives whipped MEPs to back Viktor Orbán’s dangerous platform in a vote at the European Parliament. This has received far less media coverage than allegations of antisemitism against Corbyn and Labour that just don’t stack up. Citizens who are sick of the smear campaign against Corbyn will no doubt welcome Chomsky’s intervention. The Jewish intellectual pointed to the broader context: the Labour leader represents an existential threat to the establishment. And it won’t go down without a fight.